Ian Litton (Positive Attributes), consultant David Wilde, Salman Chaudhri (FutureGov) and Martin Sadler of Digital Gaps agree that councils need to be thinking differently about collecting and using customer data for identity and authentication. The value of individual council customer accounts and the possible existence more than 400 of them around the UK, gets given short shrift by our panel (not to mention the studio audience paticipating in this video event). Ian Litton provides details of work he has been doing to demonstrate potential savings to councils from using Verify, which could allow them to access data from government departments about eligibility for services like blue badges, enabling them to process applications quickly and without the customer being present to show documents. From the citizen perspective, technologies and standards are becoming available to give them control over their data and how it can be used by organisations. The concept of the personal data store, and the impact of GDPR in giving people the right to find out what data organisations hold about them, are also discussed. On 6th February 2019 we will be holding another 'Audience with..' event, like the one where the above video was recorded. 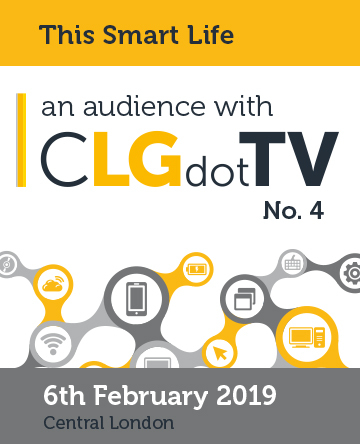 We will be making five programmes about 'smart lives' in front of a studio audience. You could be in front of the camera or in our expert audience.